Besides the opera house, the convent church was the place to hear some of the most talented female musicians in “public” up through the Enlightenment. Of course, performances of sacred music during convent liturgies were hardly concerts. Enclosure rules became strictly enforced in female monasteries certainly by the time the Council of Trent reforms gained traction throughout the Catholic world. Nuns’ choir lofts were often positioned such that they would be hidden from public view. Sometimes, as in Novohispanic convent churches, these choir structures included screens and curtains to mask still further the visibility of the cloistered nuns. As the work of Robert Kendrick, Craig Monson, and others has demonstrated, wealthy patrons typically endowed early modern convents with the funds necessary to run successful music programs, which included singing chant and polyphony and performance on various instruments. Even though they knew they would not see the nuns perform, urban citizens flocked to the convent churches anyway, especially on major feast days, to savor the echoes of the invisible convent choirs. The 17th-century English priest Thomas Gage noted that the popularity of convent music had transferred to the New World: “The people are drawn to their churches more for the delight of the music than for any delight in the service of God,” he said in his journal published as Travels in the New World. Nuns’ music is once again in the metaphorical spotlight, and it involves the choir of the Benedictines of Mary, Queen of the Apostles, living as cloistered nuns in the Priory of Our Lady of Ephesus, some forty miles north of Kansas City. Recordings of their hymns and chants—in Latin and English—for sale on the Decca label have consistently set and maintained records on Billboard’s classical chart. Their latest album, Lent at Ephesus, is currently at no. 3 for this week’s top selling classical albums, following weeks of being no. 1 or 2 since the release in February. Such ratings are not new for the sisters’ recordings: their previous two albums, Advent at Ephesus and Angels and Saints at Ephesus, garnered their share of time as Billboard’s no. 1, drawing attention from news media including the Wall Street Journal and National Public Radio. Gone is the prestige and grandeur of the large wealthy urban convents. Our Lady of Ephesus is located in rural Missouri on a property where daily manual labor is required of all the sisters along with singing the Divine Office and Mass. Societal norms providing women with only two options for living a decent life—marriage or the convent—are also a thing of the past in the 21st-century Western world. The nuns at Ephesus are cloistered in their priory by their own free will, discerned through a lengthy four-stage process of formation described in the convent’s website (!) This is one of the only means by which they communicate with the outside world: they prefer email and fax and/or letter writing to phone conversations. They also use the site for selling CDs, making note of their Billboard success on some of their publicity flyers available for print as downloadable PDF to help spread the word. 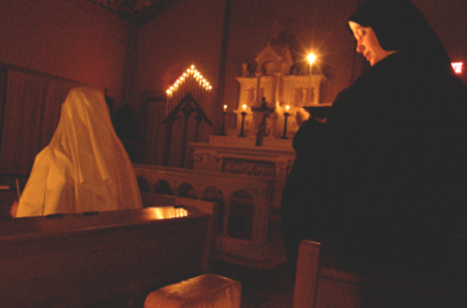 The nuns are silent as much as possible so as to remain in contemplative prayer throughout the day, save for when they gather in their chapel to sing their liturgies and, during free hours, to record. They use the profits to pay off their building, which serves as a retreat for priests. The music is sung in four-part harmony, and some of the chants include drones. Most of the pieces consist of standard Catholic repertoire, while a few texts are composed anew. The nuns’ musical skills vary, though most of them learn as they go. The prioress and choir director, Sister Cecilia, is the only professional musician, having been trained as a French horn player and having performed with the Columbus Symphony before taking her vows at Our Lady of Ephesus. Sister Cecilia reports that the publicity attendant on topping the charts is well received, insofar as it helps sell more records to support the convent finances. They are motivated by a spirit to please God and by the long tradition of Benedictine prayer through song. New York Public Radio’s blog entry on the nuns at Ephesus reports that public interest in chant is a recurring phenomenon: it was popular in the 1990s as well. And there appears to be a general interest in the all-female timbre. The Newberry Consort, for example, will be presenting its second concert of all-female polyphonic convent music from 17th-century New Spain in May as a response to their success with the performance of similar repertory two years ago. During public presentations of my research, non-music specialists consistently ask me about where to obtain recordings of all-female convent music, and I have pointed them to the Our Lady of Ephesus recordings. Cesar Favila is a Ph.D. candidate in music history and theory at the University of Chicago. He researches music in Convents of the Order of the Immaculate Conception (Conceptionists) in New Spain.